Warren Johnson and Stephanie Parry cruised from 2004 to 2007 aboard Mico Verde, a Westsail 32’ hailing from Seattle, WA, USA. They left Washington, heading down the US Coast through Mexico as far South as Zihuatanejo and then across the South Pacific from the Marquesas to Australia and through Indonesia and Singapore. You can learn more about their travels on their website or via email (micoverde@gmail.com). They say: We started cruising when we were both 29, and ended when we were 33. We stopped cruising in Singapore where we sold Mico Verde. Two months after leaving the boat, we moved to Beijing, China where we worked, got master’s degrees, and had a baby (not necessarily in that order). Still in China as of December 2010. Bought a small, cheap 25’ boat on which we practiced sailing and moved aboard so that we could save on housing expenses. 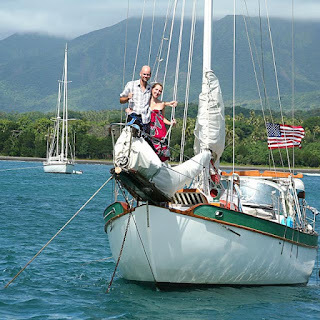 We moved aboard in the spring and had all summer in Seattle to enjoy living on board but with fall and winter looming, we wanted to be living more comfortably aboard the cruising boat by the end of summer. So we kicked our research/shopping around into high gear. We decided on a Westsail because of the price (at the time they could be had for ~$50k), the offshore seaworthiness, and the look. Warren visited a few Westsails on the west coast and we decided on one that was in San Diego, CA. We had her put on a trailer and towed up to Seattle. She had been cruising in Mexico relatively recently so was in great condition and we really didn’t have to do too much work on her through the winter and summer. We had always planned to leave Seattle sometime in August 2004 and get down the west coast to California by September, and we were able to stick to that schedule. I have been in the country I’m provisioning in for a couple months, and the port I’m provisioning in for a few weeks, so I know what is available. I list 15-20 meals that can be made with items in the local markets and then build a matrix assuming that we will feed ourselves from those meals for 3 months. The meals I plan are usually the main meals you’d consider for dinner planning, so I also have a list going of what we’ll need for breakfast and snacks. Lunch stuff just seemed to come together on its own and was less of a planned affair. Then, I make a massive list and it usually takes a few trips that result in several full carts. Warren came along as a pack mule but I wouldn’t let him influence my list or decisions once in the store or he would try to cut back, always thinking that we were buying way more than necessary. But in the end it was usually just about right. Sometimes we would buy too much of something that in the end we didn’t like (canned broccoli – sounded so practical, tasted so awful) but we could usually find people that would trade for it. I’d often cook from my meal plan, especially on passage, but in port dinners were much more improvised based on local restaurants or whatever was available fresh. This is hard to answer because different cruisers have different lifestyles. Some ports have people living aboard their sailboats that are anchored, and have been so for years. Those people will say they spend 100% of their time anchored. But does that sound like the kind of cruising life you’d like to lead? Our cruising style was generally not to be in too much of a rush. We were very careful to make sure weather would be favorable, we had the charts for our destination, and that we both felt up to making a passage. Warren also loved to get to know a place, whereas I was always champing at the bit to see the next anchorage. But because Warren was the captain, his pace generally won out. So I would say we generally were at the end of the pack during the cruising season, and might not always get to the most remote or un-charted anchorages. With that said, on passages we sailed as much as we could – if we had 8 knots of apparent wind, we’d sail unless we wanted to reach an anchorage before night and needed to move faster in order to do so. If anchorages were comfortable, we’d always choose to anchor. 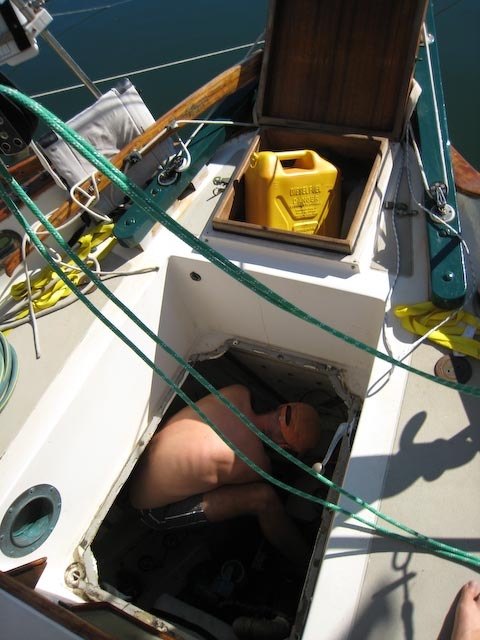 We only pulled into marinas to make life easier, for instance if we needed to do some work on the boat or if the anchorages were non-existent or extremely uncomfortable. But if an anchorage is really uncomfortable, we’d usually move to a better one unless there was some reason to go into shore, like to check in or get provisions. Suwarrow, Cook Islands, was probably the only single anchorage where we wish we could have stayed longer. Because of weather and visas, we had to leave French Polynesia, but we’d go back to all the island chains in FP again in a heartbeat. Wish we could have seen more of the Puget Sound. There were so many, it is hard to just list one. In Indonesia, we stopped at a town called Bima. A man and his son approached Warren and asked him if he’d like to come home with them. Warren went home with them, met the rest of their family and their pet monkey, and agreed to come meet the man’s class of students at the local business vocational school. The next day both Warren and I went with him to his school where we each gave short talks to the students (who all had a fair understanding of English) about what we did in our careers, and then took questions from the students. Some students asked very thoughtful questions, like “How can we attract more tourists to Bima?” while others asked some questions exhibiting their curiosity about other cultures, like, “Do you have children? Why not?” It was a lot of fun to be able to interact with this small sampling of Indonesian teenagers. We missed: a rectangular mattress, steady flow of electricity, showers, being able to walk on land without a dinghy ride first. When we knew we’d be in a place for a while that had a post office or an address we could use (e.g., a marina), we’d ask our mail service to send us everything that had accumulated to that point. Our mail service was really bad and would often not send us mail even after we’d requested it, so eventually we learned to deal without mail. Occasionally friends or family would want to send us something, but I suspect now you could get away without mail at all, or very rarely, as long as you can get email or an Internet connection every once in a while. Padlock on the main hatch of the boat, and closed the rest of the hatches from the inside. We had a padlock on the outboard that made it difficult to remove from the dinghy. The dinghy itself we usually didn’t lock up, though I seem to remember once or twice we had a really clumsy system with a chain and a padlock securing it to the dock. After Cabo San Lucas, we never left anything in the dinghy. Someone stole our flashlight out of it when we went ashore there at night. Our last night at anchor (in Indonesia, before heading for Singapore) someone stole Warren’s flip-flop shoes out of the dinghy. We had the last laugh because Warren’s feet were so big we had a really hard time finding shoes in Indonesia that would fit him. I’m sure the thief got home with his new pair of shoes and realized they were several sizes too big for him, or anyone, to wear. For me (Stephanie): the sailing. Don’t get me wrong, I never liked the sailing all THAT much, but when conditions are in that perfect state – downwind, calm seas, fair weather – it can be pretty awesome. I’m not sure what Warren would say – he’d probably say the satisfaction of knowing his Perkins 4-108 intimately and being confident that it would see us through thanks to his hard work. After 3 years of living on land, do you still wish you were cruising? We were pretty burned out when we decided to stop cruising. We went cheap and low-tech so we could do it sooner rather than later. But after a while, modern convenience started to look really nice. We have no regrets about it, and of course the hard times recede into distant memory while the good times stand in stark contrast to the every-day-ness of living on land. 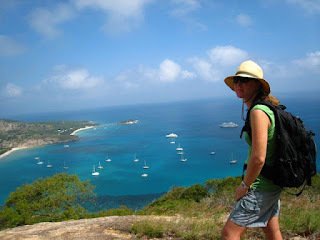 But that cruise did teach us that living simply is possible and desirable, that being close to nature is something we both love and miss, and that missing a shower or two isn’t that bad if you can live in a bathing suit most days. We’re starting to talk about the next cruise and how important it is for our daughter to get to experience some of it. We’re still in the negotiation phase (Warren later, me sooner), but I think it made such an impression on us that we do want to do it again. It’s a great life.